Although remodeling a bathroom can add value to a home, there also are many opportunities for missteps. If you’re considering a bathroom renovation, follow this expert advice from realtor.com to ensure that the process goes as smoothly as possible. While focusing on your sleek, new programmable shower, don’t forget about the bathroom’s less glamorous needs—like how fresh air will enter the room. Underestimating the necessary ventilation is a huge mistake, especially since the bathroom is the dampest room in the house and can be a breeding ground for mold. Insufficient aeration also could lead to mildew or persistent odors. That’s why it’s important to include an exhaust fan in the plans and budget accordingly. And always pay for quality when it comes to your exhaust fan. Unless you’re absolutely, positively sure that this is your forever home and you’ll never sell it, you should always include a bathtub or shower in the remodeling plans. 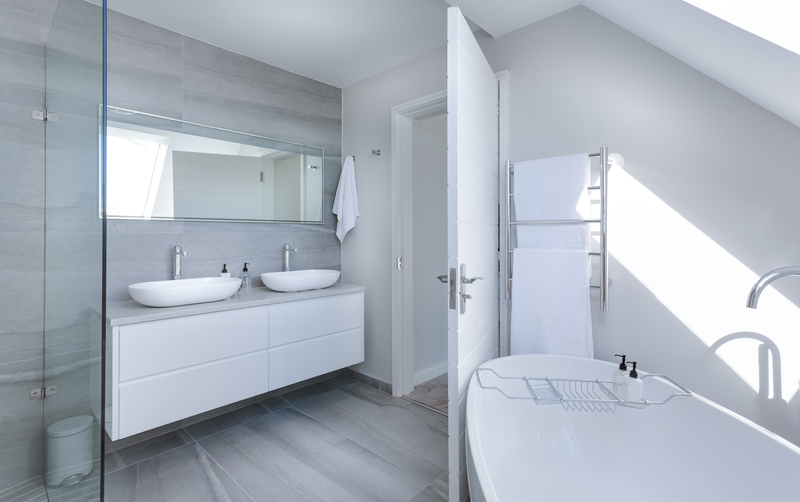 Although the trend in bathroom renovation is ripping out the tubs and replacing them with walk-in showers, this could potentially limit potential home buyers. If installed incorrectly, the shower can start to leak and cause problems such as structural damage. Storage and shelving are sometimes overlooked in favor of trendy design choices. For example, some people today are opting for a mirror above the sink rather than a practical medicine cabinet, and buyers often are turned off by the fact that the mirror takes up a lot of wall space and offers no additional storage. A pedestal sink is another stylish option, but a vanity sink with cabinets will be better for hiding all of your bathroom clutter. The extra storage space provided by more countertop and cabinets with drawers will be more useful. Although marble is a luxurious choice for any surface in your home, it might not be the smartest choice for bathroom flooring. Aside from the high cost, it’s cold, slippery and difficult to maintain. Its porous nature, for example, makes it highly susceptible to stains and damage from beauty products, especially when marble surfaces aren’t regularly sealed. Try more durable alternatives, such as Silestone and Dekton. Manufacturing technology has advanced greatly in recent years, making it hard to tell the difference between natural stone and manmade materials that require zero maintenance and are highly stain-resistant. Don’t forget to add enough electrical outlets to plug in all of those grooming tools, including electric toothbrushes, hair dryers, electric razors, curling irons, and night lights. However, a big outlet with multiple sockets or a bulky power strip is not visually appealing, so instead install an outlet that pops out of the wall in a cube with up to three outlets, and can be popped back in for a smooth surface. Disastrous bathroom renovation fails to include a door that opens only partially, or one that slams into the sink or the toilet. Avoid this major mistake by choosing a door that you are certain will fit the available space. For smaller bathrooms, consider choosing a design with sliding doors, round doors or bi-fold doors that open inward to save space, and for larger bathrooms, consider either hinged doors or pivot doors. Perhaps the biggest bathroom remodeling mistake of all? Failing to plan for any costly surprises. It’s not uncommon to find water damage in a bathroom from something leaking or installed incorrectly. Make sure there’s some wiggle room in your budget for the unexpected. 0 Responses on "8 Mistakes to Avoid When Remodeling a Bathroom"